With the falling price of SSDs, now could finally be the right time for your big storage upgrade. The Transcend PCIe SSD 110S is positioned to be an affordable and high-performing M.2 PCIe based NVMe drive targeted for mainstream users. In this review article, we will take a deeper look at the technologies adopted by the Transcend PCIe SSD 110S and determine if the performance it provides will be sufficient for our daily usage. On the first glance, the Transcend PCIe SSD 110S looks rather simple. It connects to the system via a M.2 interface, and uses the PCIe x4 interface to communicate with the main system. Unlike usual SATA based SSDs, these new PCIe SSDs uses the NVMe protocol to translate storage commands to the system. NVMe also works around the limitations of previous generation technologies, and has the ability to harness the full potential and speed of NAND based memory. Of course, we will be able to expect performance that goes way beyond current SATA based SSDs. When it comes to SSDs, there are two main specifications and components to focus on, namely its controller and memory type. For the Transcend PCIe SSD 110S, it uses the Silicon Motion SM2263XT controller and the THGDU3B-1D03 3D NAND Flash. An interesting note about the Silicon Motion SM2263XT is that is uses a DRAM-less design. Essentially, unlike many SSDs out in the market which has a dedicated (usually DDR3 RAM) cache on the SSD PCB itself, the SM2263XT makes use of the main system memory to hold its system addressing translation tables. This memory cache mode is also known as the Host Memory Buffer, or HMB for short. Of course, because it uses the system memory for data cache, it could be likely that the performance of the system memory could have a direct impact on the performance on the SSD as well. There weren’t a lot of information about the THGDU3B-1D03 NAND flash memory online, and we were unable to find out the manufacturer or specifications of these chips. However, we could guess that these are TLC 3D NAND which supports Low Density Parity Check (LDPC). Essentially, to increase the write tolerance of these 3D NAND, LDPC checks for errors and prevents excessive writes on the NAND. This prolongs the lifespan of the SSD, giving it better stability and endurance. 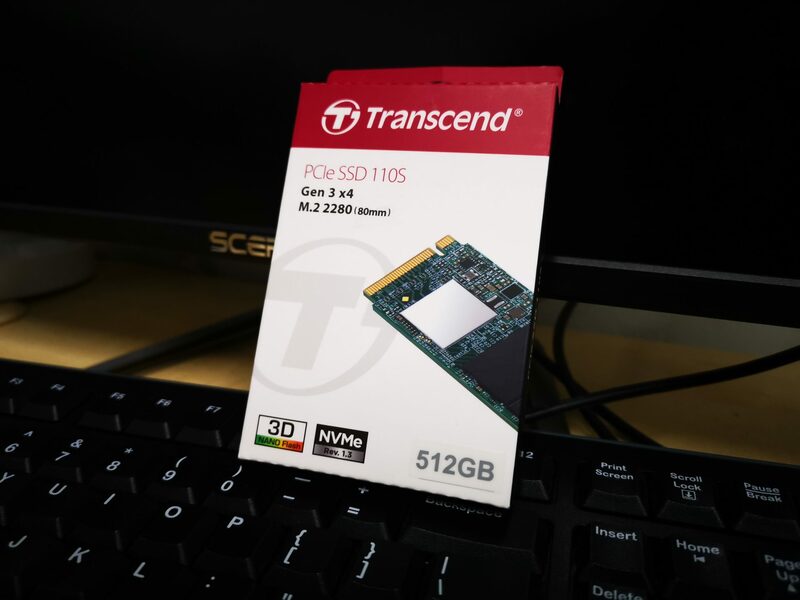 The Transcend PCIe SSD 110S also works with the Transcend SSD Scope software, which can be downloaded from the Transcend website. This is a useful software that enables users to know about the health of the SSD. Additionally, Scope also comes with useful tools such as disk cloning for users to easily migrate their data from one storage drive to another. The software also helps to seek out for new firmware updates to the SSD whenever available. We decided to run some simple storage tests on the SSD to understand it behaviors under different scenarios. For a start, we will find out the raw performance of the drive when it’s empty and find out the full potential of the drive. Subsequently, we will fill the drive with data and see if its performance will be affected. CrystalDiskMark software showed that the Transcend PCIe SSD 110S was able to achieve a sustain sequential read and write speed of 1783.8MB/s and 1516.3MB/s respectively. The drive also performed rather well in 4K tests as well, with acceptable speeds on the different test scenarios regarding 4K transfers. ATTO Disk Benchmark showed that the drive was able to reach a maximum of sequential read and write speeds of up to 1.801GB/s and 1.532GB/s respectively under different transfer sizes. AS SSD shown that the drive was performing very quickly as well, although not as high as the results shown in ATTO and CrystalDiskMark. The performance of the drive was affected by the amount of data written on it. We saw that the performance on both read and write speeds dropped when more data was written on the drive. The differences of write speeds were very heavily impacted. As we can see, these speeds dipped across different test scenarios when the drive was more than 50% full. The Transcend PCIe SSD 110S performs as marketed on its box. It was able to reach the read and write speeds in excess of 1700MB/s and 1500MB/s respectively. However, due to limitation of the technology adopted, the speeds of the SSD dropped rather significantly after data was written on them. This symptom was apparent across all the different tests by CrystalDiskMark, and it seems that the more data on the disk, the slower the disk gets. Nonetheless, even when the performance of the drive was impacted, its slowest recorded speed was still far faster than any SATA based SSDs in the market. Therefore, if the price is right and if you are simply looking at upgrading from a SATA based SSD to a PCIe NVMe based SSD, you will still achieve significant performance gains.